Robots have captured the imaginations of people for decades as a world filled with them serving in numerous capacities has been envisioned as the probable future. That has generated all sorts of interest from writers and artists, as well as those seeking to have some permanent robot ink on their bodies. Most of the robot tattoos are surprisingly creative and different, and instead of gravitating towards the more ominous look and feel one would associate with the "Terminator" movie, they look more like the vintage toy robots of the past, or more of a playful robot you would picture as part of a cartoon. 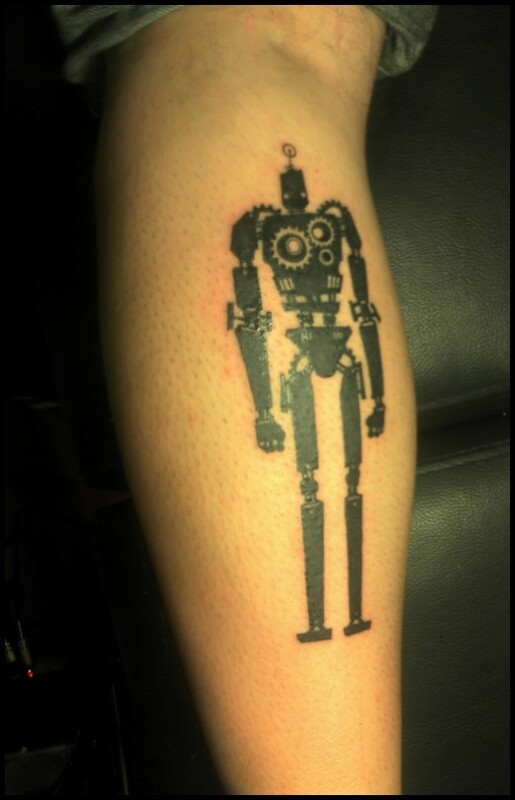 There are a few exceptions, of course, but overall, robot tattoos are a lot more whimsical and fun than I would have thought, and were a nice surprise to see. This particular article isn't about bio-mechanical tattoos, where the appearance a person is robotic within. Those are compelling and awesome when done right, but not the subject matter here. Here we're going to look at standalone robots in and of themselves as tattoos. 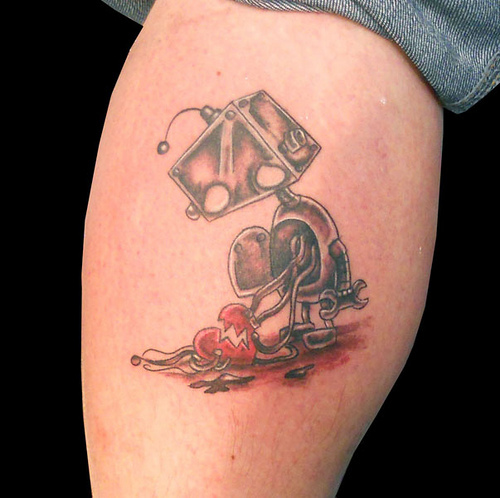 With this first robot tattoo, which one of a cartoon robot, it's as simple as it gets as far as design goes, but is very compelling in my view. It's probably the combination of color and humor of the big robot eyes that creates the great effect. You just look at the little robot and instantly like him. That little slanted mouth is also hilarious. 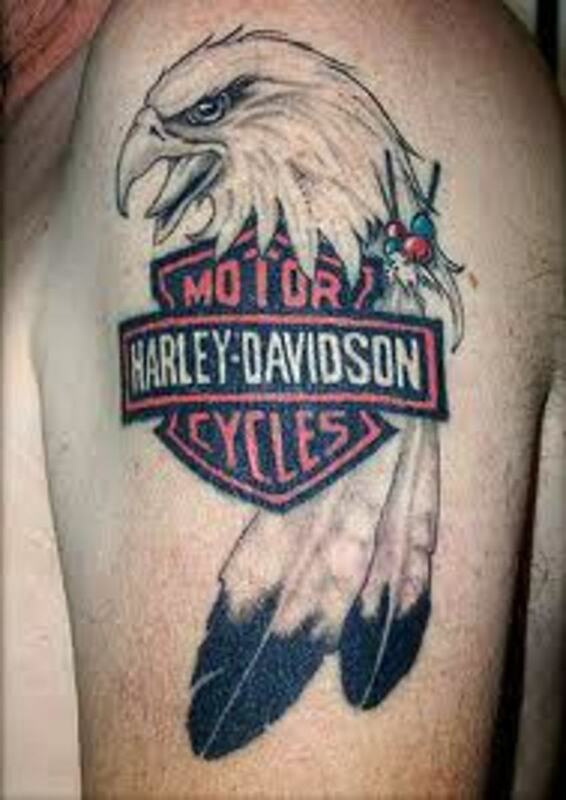 This shows the subject matter doesn't have to be tremendously sophisticated in order to have a great tattoo. I won't get into what some would consider the difference between a regular robot and a droid, but this one looks great. The combination of solid black and using the lack of ink on the skin to create the design works really well. It's also not easy to do, even though when they're done right like here, it appears so. My favorite part is the circular dials on the chest. Many of the old toy robots had this as part of their design. Bicycles, other than our knees and feet, are one of the first forms of transportation we use, and for many people that fascination has never left them, prompting them to get a tattoo with the bicycle or some of its parts as the center of the design.. I guess you could have used any dance term to describe this robot, who apparently enjoys bogeying. The position of the robot makes it appear that he is dancing to hip hop, so that's what we'll go with. My favorite part is what seems to be electricity flowing back between those antenna-like things on the head. Bulls are a huge part of cowboy culture, as they were representative of the future of cattle, with the best sires a look into the future of the herds. 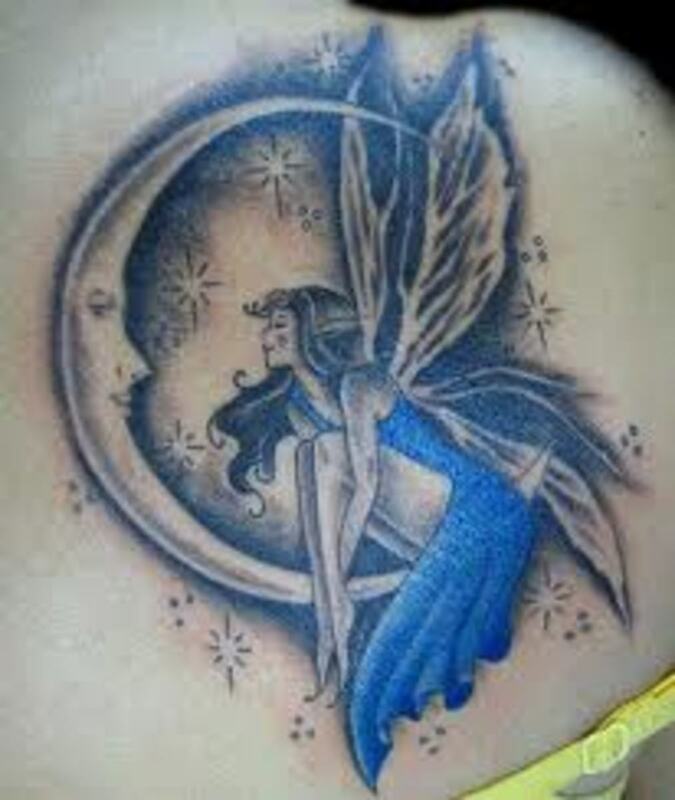 That and the power of this magnificent creature makes them a fantastic design choice for a tattoo,. 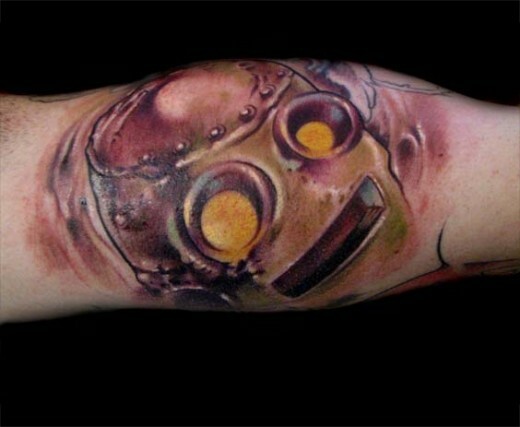 This tattoo of a robot head is pretty cool. It would have looked better on a larger skin canvass, as you can't get the full effect of the design as it is. That's something that should be carefully considered when making tattoo decisions. I've seen fantastically designed tattoos suffer because they weren't placed where they could be fully seen and appreciated. Most of the time if you have to go around the body or part of the body to see the tattoo, it's usually not a good idea. 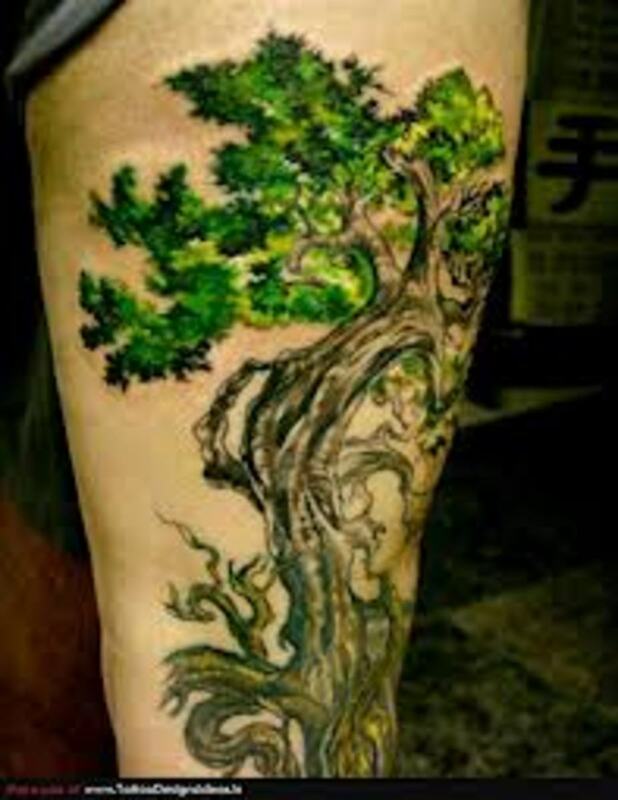 The exception are larger tattoos of a scene, where the background and characters are carefully and strategically placed. 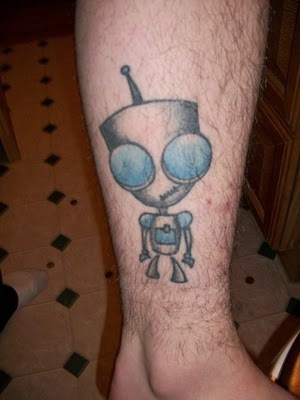 The robot tattoo, other than the limitations, looks fantastic. I like those little round connectors on the top of the head. 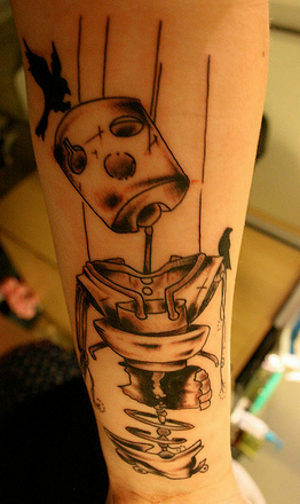 For me, tattoos that combine themes can be awesome, and it's pretty creative this robot skeleton tattoo below. I guess this is the future of all aging robots, which many of us people can relate to. The design is high quality, and the shading makes it stand out nicely. One thing creative people have done with robots for a long time is to make them similar to people, in that they have an array of emotions. 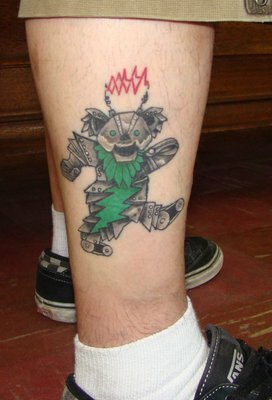 This tattoo is a good example of that, revealing that this little fellow has suffered a broken heart. The drooping antenna on the head and sad-looking eyes really make this work well. Making a robot look more human like is becoming more of a reality in the real world, as the Japanese have already made some hospital service robots appear more human-like. No matter what types of breakthroughs we have in this world, right on the heels of them will be those with an artistic bent who will start to offer up their interpretation to the subject matter. That's obviously true with robots and tattoos, and will continue to be as we forge forward into the future. I like that most of the robots retain a more winsome and fun look, rather than some of the darker and dystopian looks and feel novels and movies have portrayed.